61 Bowdoin Street, Boston, Sunday, 12 February 1865: Mary [Gray] is in a state of very happy excitement because her father has withdrawn his prohibition against round-dancing. It is very inconsistent I suppose and all that, but I have long felt a question about it; whether the old fashioned prejudices of her parents ought to enforce themselves to her exclusion from a pleasure all her young friends were allowed, and enjoyed so highly. She enjoys dancing the “German” as much as any one – but has never remonstrated against our decision, and gave it up 2 or 3 years ago without complaint. Then several other girls of her set said they were not to dance it – and it seemed as if she would have plenty of companionship in abstaining, but one after another they have all concluded to dance it and she was left almost alone – and it does make a great difference in a young lady’s enjoyment of society: it sets her completely apart from the dancing and makes a wall-flower of her at once, for there are never more than two or three square dances of an evening. I do not approve of round dances as a matter of taste – but society approves & accepts them – as it is natural young people should enjoy them, and there is no moral wrong involved, since the universality of the dance is at once sanction[ed] and safeguard[ed], I thought it right to reconsider our early decision about it, and after a serious talk with her father and obtaining his indulgent assent, I had the pleasure of telling Mary we were quite willing to let her do as her other young friends did, and enjoy dancing with them. Poor child she was quite taken by surprize & burst into tears – saying she would rather never dance a step than have her father feel distressed about it, but I sent her in to have a talk with him & she came back all in a quiver of delight & excitement with “oh Mamma you don’t know, you never can know, the difference it makes in the enjoyment of society and parties”! – but I do see and know that it must make an immense difference. [The] Grays are an unsocial race – they seclude themselves and bury themselves readily enough, without any such additional incentive as this prohibition would give to Mary. Mary is a morbidly sensitive child, and I dreaded for her the sort of isolation which would result from this line of separation between her and her young friends. [It] would result – it always does – in early withdrawal from all society, which is not a desirable thing for a young person and especially for Gray blood. [The] Grays are an unsocial race – they seclude themselves and bury themselves readily enough, without any such additional incentive as this prohibition would give to Mary. Well, well, I hope I have done right – if not, mine is the blame & mine the inconsistency, for Dr. Gray yielded to my wishes in the matter. Isa Gray’s words to her mother a few weeks since on the subject, “that she had better let Ella [Gray] grow up in utter unconsciousness of any objection to the dance, and join it – that it was an inconceivable drawback to a young girl in society &c &c” had great weight with me, for Isa is a sensible right-minded girl, and was very popular with her set, and had as good a time as any girl could not dancing the “German”! Dr. Gray’s niece Isa Elizabeth Gray (1841–1923). 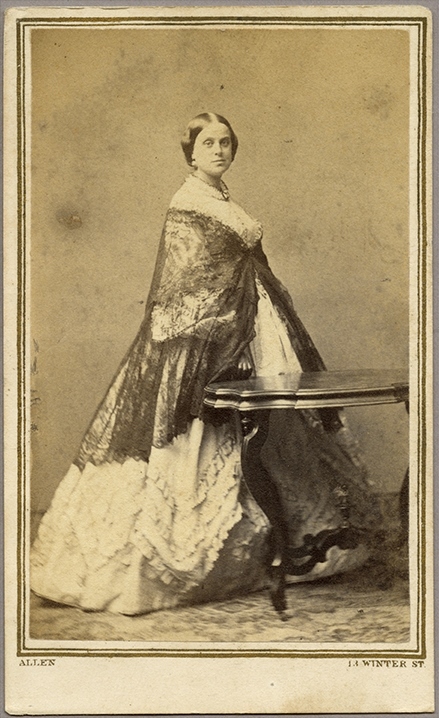 The diarist’s sister-in-law Sarah Frances Loring (1811–1892), who married William Gray in 1834. Isa’s younger sister Ellen Gray (1854–1883). LOL Mrs Gray surely saw the blessing of her contribution to the evolution of “the Gray race” your sociability surely dscends from her!! Mrs. Gray was quite firm about how the Gray sensibility — which she located in her mother-in-law, Mary Clay Gray — contrasted with her own (presumably more easy-going and social) personality. It’s a slippery slope. You start with the waltz and the next thing you know, kids are doing the macarena and the whip/nay nay.